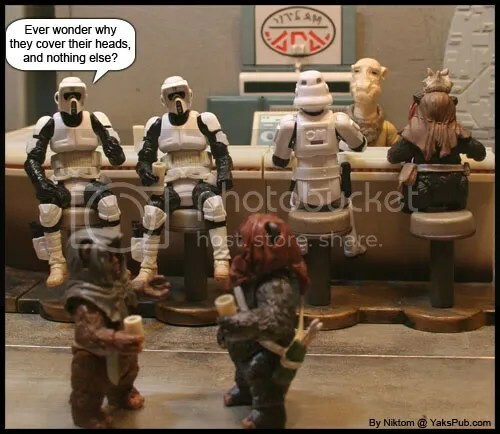 I was going to say that they must have their reproductive organs on top of their heads… but then that got me very depressed about poor Chewbacca. Who only carries a purse. I think its the same as on bears. The fur covers the-you now-parts. Anonymous, I think its less that they don’t cover their “parts” as that they bother to cover anything. And if they were going to cover anything, why their heads? I think the better question is why Donald Duck bothers to cover his lower half with a towel when he gets out of the shower, when he spends the rest of the time pantsless. Also, I should point out that as a lifelong way-below-average-height guy, I was a huge Ewok fan when Jedi came out, and at the age of 35, they’re still the “cat’s meow” in my book!